A good Autograph Letter Signed, discussing in detail the book he has been working on, about law and religion among the Fijians, the effects of Western contacts, “and the people sit bewildered among the ruins of the Old, watching the New with curiosity and suspicion.” 4 pp. 7 x 4½ inches, fine. Princetown, Dartmoor, 4 May 1898. Sir Basil Home Thomson KCB (1861 – 1939), intelligence officer, police officer, prison governor, colonial administrator, and writer. Assistant Commissioner Metropolitan Police, 1913. Director of Intelligence, Scotland Yard, 1919-1921. Thomson’s work as Assistant Commissioner of Scotland Yard Involved a wide range of investigations. His natural conservatism was given full throttle against suffragettes, then against spies from Imperial Germany and its allies, then against Irish nationalists, and finally against British Marxists. 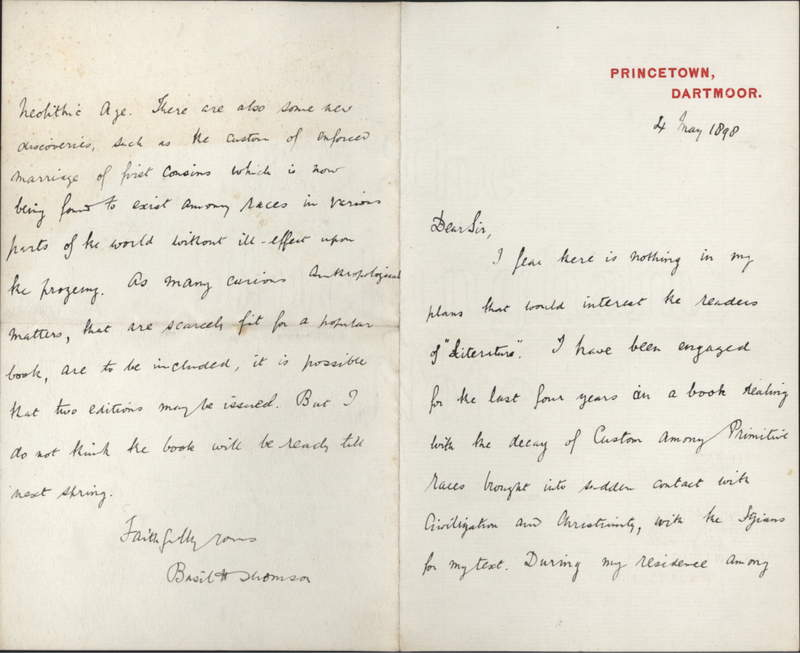 Thomson was involved with the spreading of public awareness of the “Black Diaries” used against Sir Roger Casement to prevent public support for a reduction of Casement’s death sentence for high treason in 1916.